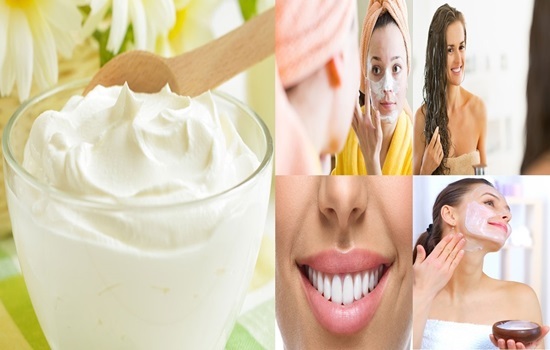 Who doesn’t like yogurt, it is creamy and nutritious, flavored or plain, it is always there for when you feel for snack or even a meal, it is always plenty in the fridge, and now you can even take yogurt a step higher and use it to enhance your beauty, did you know that there are many beauty uses for yogurt? The following list will inform you about a few ways you can enhance your beauty using yogurt. 1- Use Yogurt To Get Rid Of Dandruff. Yogurt can smoothens your scalp, reduce itchiness and eliminate dandruff completely, all that besides nourishing and moisturizing your hair, just apply cold yogurt to your scalp and hair and allow it to sit for at least twisty minutes before a head wash, follow this remedy at least once or twice a week. 2- Use Yogurt To Treat Sunburns. Yogurt contains zinc which is perfect to treat all minor skin problems, it will also help to sooth the itchiness and discomfort that are associated with sunburns, just apply some cold yogurt to the affected areas for twenty minutes before washing off. 3- Use Yogurt For A Better Oral Health. Yogurt contains calcium and phosphorus which forms a protective layer to protect the teeth enamel from plaque and yellowness, when applied locally it helps to balance the pH levels of the mouth which in turn prevents bad breath, just brush with the tooth brush on your teeth once a day. 4- Use It For Exfoliation. Mix some ground walnuts with yogurt to create a skin defoliant, the walnuts will help to get rid of dead skin cells while the yogurt nourishes the skin and moisturize it, exfoliate your skin with this mixture once a week. 5- Use Yogurt To Keep Aging Signs At Bay. Cucumber and yogurt is a traditional remedy to keep aging signs at bay, cucumber has a nice soothing and cooling effect on the skin, it also helps to tighten opened pores, while yogurt helps to nourish the skin and keep it firmed, use this remedy at least once a week. 6- Use Yogurt To Get Rid Of Black Heads. You can mix your with rice flour to form a paste that you can scrub the areas with white and black heads gently with a circular motion, you can also add Turmeric Powder for an extra whitening benefit. 7- Use Yogurt To Reverse Tanning. Mix yogurt with gram flour and lemon juice to bleach tanned area on your skin, apply the paste generously and allow it to get near to drying up then wash it off with cold water then apply rosewater to your skin.